Hi All! I’m so excited to be guest posting! This is my first time, so give me grace! 😀 I’ll give ya a synopses of ‘me’ to introduce myself and then on to the yummy stuff! Let’s see… Me…. 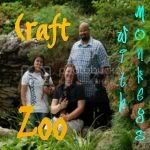 My name is Kaycee and I host a blog called Crafty Zoo with Monkeys. I call it the Zoo because my house is crazy and always busy! I call my daughter my Monkey, a nickname that started long ago and has stuck around! Our home consists of myself, my husband, our Monkey, our roommate named Bear (no, that’s not a joke), 2 chihuahua’s, a great dane, and a frog! (Also, briefly and no more we had a pet snake visiting!) My blog consists of a very eclectic collection of things that fill my life. Recipes, crafts, DIY’s, Giveaways, Reviews, Scrapbooking, Sewing, and whatever random thing I think of to post! You can find out more over at The Zoo!!! My daughter and I found this recipe on line and decided we HAD to make it! I will admit, they are super yummy! This is a great cookie, assuming you like a lot of peppermint! If not, see my notes below to modify it so that the mint isn’t so strong!!! Whisk flour, cocoa powder, baking soda, baking powder, and salt in a bowl. I put them in a plastic container and shook them together! In another bowl, beat butter and sugar with a mixer on medium-high speed for about a minute. Reduce speed to medium-low, and add eggs and peppermint extract. Slowly add flour mixture and beat until just incorporated. Divide dough in half and place on two large pieces of plastic wrap. Using plastic wrap, slope dough into logs about 2” in diameter. I found it was easiest to roll wrap them in the plastic wrap then shape them! Wrap logs securely in the plastic wrap and refrigerate until firm, at least 1-2 hours or several days. When ready to bake, preheat oven to 325º F. Spray baking sheet with non-stick cooking spray. Cut logs into ¼ to ½ inch discs. Gently shape cookies into circles if necessary, remember that the way these look when you put them on the baking pan is the way they will come out! SO, if you don’t want any creases, smooth them out before baking! Keep unused dough in the fridge until ready to slice. Bake cookies for 10 minutes, or until dry to touch. Cool 2 minutes on baking sheet before moving them to wire cooling rack. Melt chocolate in double boiler. Melt slowly. Place crushed peppermint in bowl with tall sides. Dip cookie in chocolate then in peppermint. The easiest, and probably laziest, is to drop the cookie (melted chocolate down) then shake cookie around to cover chocolate, then put the cookie back on the cooling rack to harden. I will note that I took the lazy way… I mean…. Most efficient!!! Also, note that I doubled the recipe and made some without peppermint on top as chief Zoo Keeper (my hubby) doesn’t really like peppermint all that much! Anyone for Chocolate Peppermint Cookies?